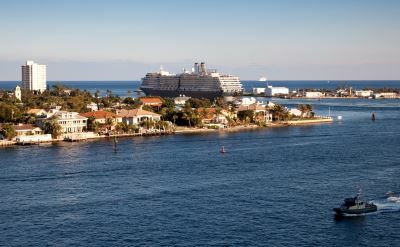 Port Everglades is the Fort Lauderdale area cruise port. 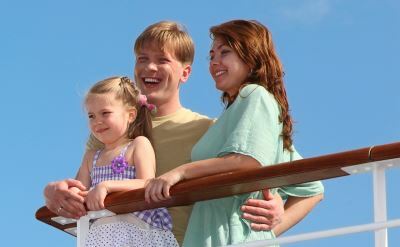 The 9 cruise terminals handle millions of happy passengers every year. Access to Port Everglades terminal is extremely easy by either highway or air. All passengers departing from Port Everglades will enter the port through a security check-point. Everyone in the vehicle over the age of 18 must be prepared to present a photo ID as well as travel documents for the departing passengers. This video is about growth and activities at Port Everglades. Fort Lauderdale/Hollywood International Airport is located less than two miles from Port Everglades. Leave a minimum of 45 minutes for the transfer process to allow for time to claim your luggage at the airport and to fill out forms during check-in at the cruise terminal. A taxi is the most convenient and straight-forward transportation between the airport and the cruise port. 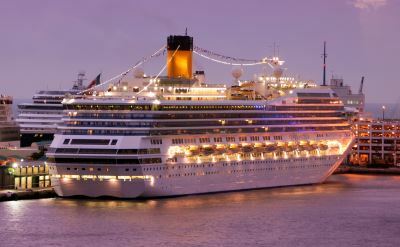 It is a good idea to arrive the day before your cruise departs. That way travel delays won't cause you to miss your cruise. There are hotels near the port. Port Everglades' primary entrance is from I-595, whose eastern terminus is the port's entrance road, Eller Drive. I-595 connects with I-95, which runs along the entire east coast of the United States, as well as the Florida Turnpike, Sawgrass Expressway and I-75. 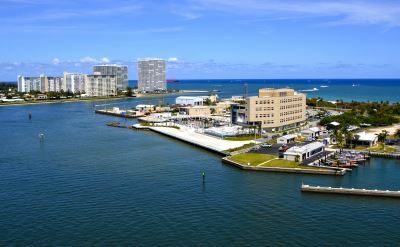 The port also can be accessed at the intersection of State Road 84 (east) and US1 or by taking US1 or A1A to the 17th Street Causeway in Fort Lauderdale and turning south on Eisenhower Boulevard. Cruise terminals 1, 2, and 4 are located at the north end of the port. Cruise terminals 18, 19, 21, 22, 24, 25, 26, and 29 are at the Midport facilities located in the center section of the port. Confirm your terminal assignment before leaving for Port Everglades. This information can be found in your travel documents or obtained directly from the cruise line. The official Port Everglades CruiseSchedule app provides the cruise terminal for each departing ship. Terminal dock assignment is available 30 days before departure. Directional signs with ship names and terminal assignments are located throughout the port and are updated daily. Read these signs carefully when arriving at Port Everglades because they will guide you to your ship. Port Everglades address is 1850 Eller Drive, Fort Lauderdale, FL 33316. For GPS, you can use the intersection of SE 17th Street and Eisenhower Blvd, Fort Lauderdale which is one of the entrances to the port.